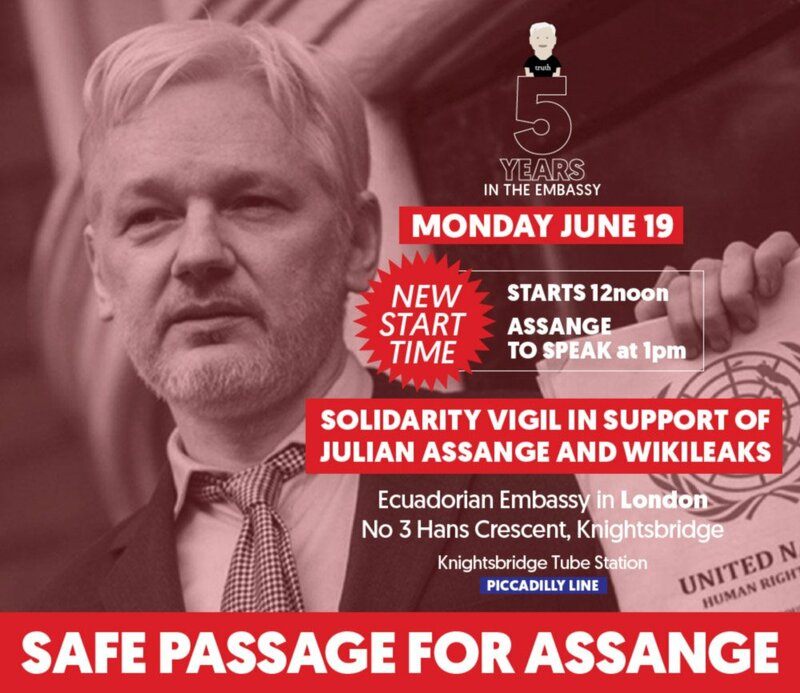 Julian Assange is going to speak from the Ecuadorian Embassy in London on Monday the 19th of June at 13:00 in the afternoon. This marks his fifth anniversary inside the Ecuadorian Embassy where he has found refuge and was granted diplomatic asylum. We shall gather in a Solidarity Vigil supporting of Julian Assange and WikiLeaks on Monday 19/06/2017 from 12:00 noon outside the Ecuadorian Embassy in London, No 3 Hans Crescent, Knightsbridge. You can get there by Tube: Knightsbridge Tube Station ( Piccadilly Line). If you need further information please contact Emmy Butlin 07952 434569. Many of the supporters will remain outside the embassy till after 5pm to accommodate people who made arrangements to attend the vigil after work as originally advertised at the time of 5pm. See you outside the Embassy in support of the heroic WikiLeaks Editor! Gallery | This entry was posted in Assange, WikiLeaks and tagged Ecuadorian Embassy, Julian Assange, WikiLeaks. Bookmark the permalink.